1910-1914 autograph album of Harry Raymond Bowers of Omar, New York, presumably the village in Alexandria, New York, in Jefferson County. The album has a copper embellishment on the front cover and measures approximately 6-1/2" x 4-1/4". It contains the sentiments of 12 of Harry's relatives and friends. An alphabetical surname list and an alphabetical list of the signers, together with any personal information they offered, appear at the end of this post. Harry Raymond Bowers was born September 22, 1897 in Jefferson County, New York, the son of Sidney Theodore Bowers and Cora A. (Collins) Bowers. 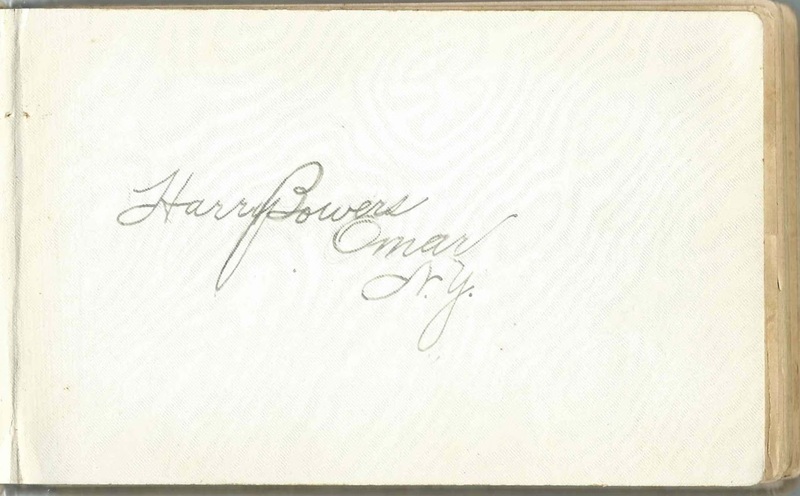 Harry had a sister, Hazel L. Bowers, who inscribed a page in his album on February 14, 1911. Two signers indicated they were Harry's cousins: Grace Keech, who inscribed a page on August 1, 1911; and Mary Keech, who inscribed a page on July 17, 1912. Between 1920 an 1930, Harry Raymond Bowers married Viola Norton. They settled at Alexandria, New York. Viola died in 1983, and Harry in 1984.